Before the general use of ‘chemical’ raising agents – Bicarbonate of Soda and Baking Powder – there were only two ways of making flour mixtures light. Either beating eggs for over an hour to trap air, or using yeast. 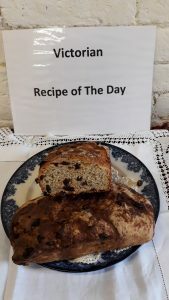 Visitors on our February Steaming Sunday were able to taste a YEAST CAKE – called in Eliza Acton’s book A Light Luncheon Biscuit(!) or Nursery Cake. Many Victorian recipes are a little more dry and slightly more dense than we experience today. They are nevertheless very pleasant but different! So to our modern tastes we might call this a Bun Loaf rather than term it a cake and serve it spread with a little butter. These YEAST CAKES are very traditional across many regions of the United Kingdom, all areas believing they had the best and most authentic receipt (recipe). Many added a range of different spices including – mixed spice, cinnamon, allspice, cloves, nutmeg, but some did not. Not wishing to favour one part of the country over another the recipe given below is one from Isabella Beeton’s Book of Household Management – But half quantity! A few notes about making this Yeast Cake. When mixing in the sugar and dried fruit it is advisable to do this in a bowl, otherwise the dried fruit goes everywhere! It does freeze well so you don’t have to eat it all in one sitting!